Charlie Davis has piled onto his big year with a second place finish in the BCBC tourney. Charlie was third in the NHC this past January in Las Vegas. 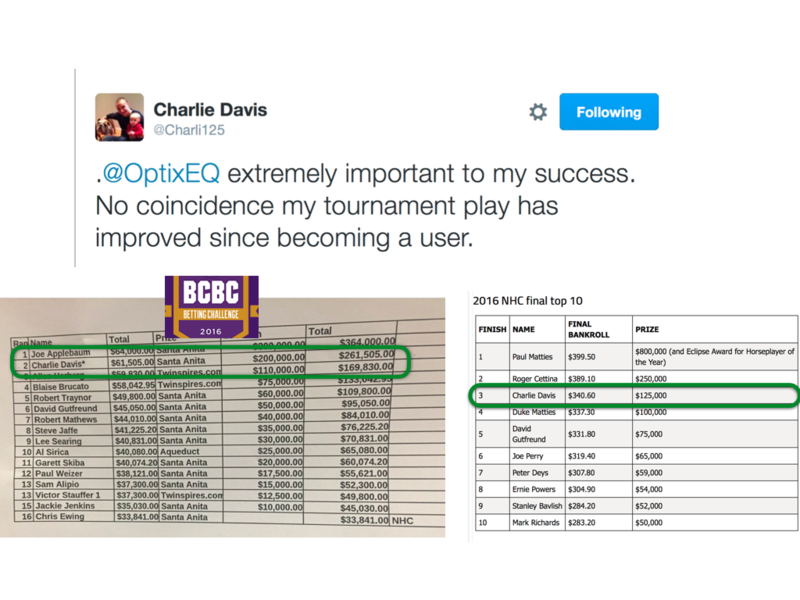 In addition this year Charlie has won a live money bankroll tournament at Canterbury Park and was second in DelMar’s summer cash tournament. What a year. Go here to watch our analysis of the 2016 BC Sprint using OptixPLOT and OptixNOTES. Go here to watch our analysis of the 2016 BC Juvenile using OptixWORKS and OptixNOTES. Go here to watch our analysis of the 2016 BC Classic using OptixPLOT. Go here to watch our analysis of the 2016 BC F&M Sprint using OptixEQ products. Also Frank Scatoni’s horse by horse evaluation is attached. © 2019 optixEQ (C) EquiLytix LLC. All rights reserved.